Q： What makes Skyrich lithium battery different from traditional lead-acid batteries? Q: What’s the difference between Skyrich lithium battery and other lithium batteries? The following video also illustrates key safety advantages when using our lithium iron phosphate (LiFePO4) composition: click here. Q： The price of Skyrich lithium engine start battery is higher than traditional lead-acid starting batteries, why should choose Skyrich lithium battery? 3.No need to fill acid, Maintenance free, no leak problem, Any direction installation permit, Safety and stable. 5.Premium charge acceptance, rechargeable with 10 C current and recharged within 6 minutes. Even if lower capacity status,it can be recharged within short time. Q： The capacity of Skyrich lithium battery is lower than traditional lead-acid battery，so how can Skyrich lithium battery work and performs better than traditional batteries? A:Skyrich lithium battery is made of extremely high energy density lithium iron phosphate material, and it is designed by Skyrich patent technology. The watt density is 5 times more than existing lead-acid battery, and it can realize the high rate discharge capacity. So even though the capacity is lower than traditional battery, it can be use normally, and perform better than traditional batteries. Q： I know lead-acid battery models, how do I choose and buy Skyrich lithium battery? 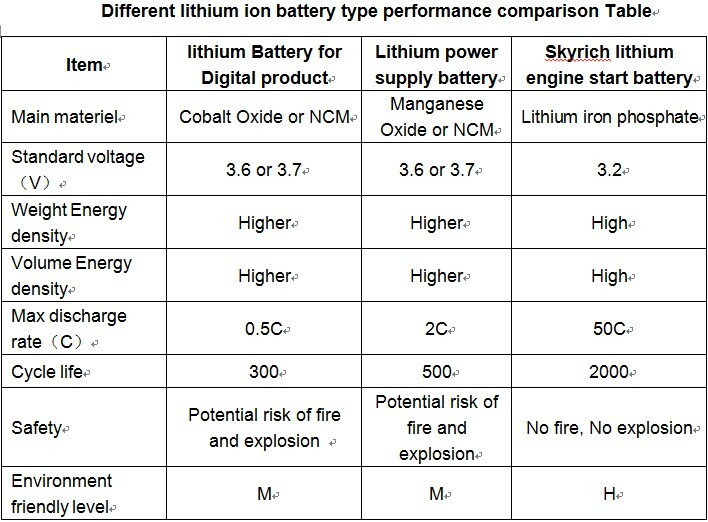 A:Mostly Skyrich lithium battery models have the corresponding lead-acid battery, some have same or similar models name, mostly you can find same or similar size of Skyrich lithium battery to lead acid battery, it can be replaced lead-acid battery directly, check specification for detail information. Q: How do I test the cranking performance of Skyrich lithium battery and traditional battery? A:Aside from testing our battery by using in real vehicle, we can also use battery cranking performance testers to do quick test for these two kind batteries. Q: Can I use Lead-Acid battery chargers to charge a skyrich lithium battery? A:Yes. However, please do not charge skyrich lithium battery by a charger without charging voltage limitation function, by which the charging voltage can be limited to be below 15V. Do not use a charger that has an automatic desulfactor and cannot be turned off. If able to turn off then the charger is safe to use. 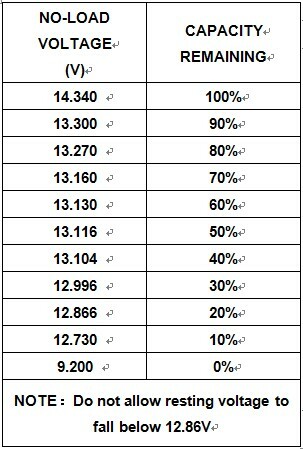 Q: How do you check the remaining capacity for Skyrich lithium battery? A:If battery will not be used for more than two weeks, it is better to remove the battery from the vehicles and stored. In order to avoid batteries discharging by tiny current in vehicles, which may cause battery failure by overcharge. Normally, if the full charge battery is stored one year or longer, the left capacity still can start the motorcycle successfully. Accordingly, it doesn’t need to disconnect the battery and motorcycle cable if no current delivers in the motorcycle when the key is off. Mostly motorcycle models produced by regularly manufacturer do not have the current delivers when the key is off. if additional security installment or control system in the motorcycle, The motorcycle still delivers the current to keep the clock, computer and security installment operating when the key is off. In this case that the motorcycle is in storage for long time, the battery will be damaged in one week after battery full discharge due to lithium engine start battery low capacity. Please remove the battery or disconnect the battery cable if you do not use the motorcycle for two weeks or longer, In order to avoid batteries discharging by tiny current in vehicles, which may cause battery failure by overcharge. Please measure and confirm the battery voltage is higher than 13V before re-installing the battery, or use dedicated charger to recharge the battery 30min if the voltage is less than 13V. Q: Can I use Skyrich lithium battery normally in low-temperature environment? A:Lithium batteries cranking performance will be degraded as temperature drops,. However, they still react to cranking under -10℃. Lead-acid battery type will increase resistance on each subsequent cranking attempt, until it won’t turn over. If your Lithium Iron Phosphate battery fails to start on first crank, that first start has warmed the battery, and the second attempt will be much stronger, and so on until you get a good start. Due to our low resistance formulation, the performance of Skyrich lithium battery under cold conditions is better than other brand lithium battery. During minus 5℃environment temperature, most users can start the motorcycle on first try. If under low temperature condition, please turn on your motorcycle spotlight after key on, it is good for the batteries because of the current delivery, but the lighting time depending on the temperature. 30 seconds if minus 5℃environment temperature, 4-5 min if minus 5℃environment temperature, this ensures the motorcycle would start on the first try, and protects the battery cycle for longer performance. Q: How should Skyrich Lithium battery be disposed? A:Our Skyrich Lithium battery contains no lead or acid; it meets the European ROHS standards for environmental health. Please check with your local authority if LiFePO4 battery is allowed to put into the general dust bin. If so, fully discharge the battery before disposal, Such as using a 12V light until it is no longer lit. We expect that there will also be recycling available in some locations, and more coming in the years ahead. Q: Can Skyrich Lithium battery be mounted in any position? A:Yes, because there are no liquids in the Skyrich lithium batteries. Any direction installation is permitted, including upside down. Q: How long will our Skyrich Lithium battery last? A:That depends on many factors. Under the worst conditions, a lead acid battery may l ast only a few weeks and under the best about 3-4 years (top-quality brands with regular use). In between you will find a wide variety of user experiences. Our research indicates an average of about 1 to 2 years lifespan for lead-acid. Under the same average usage conditions, we expect Skyrich Lithium battery to last roughly double, or 3 to 4 years. Under ideal usage and storage conditions, we expect 6 to 8 years to be achievable. Q: I heard the news that lithium batteries exploded hurting people. How is the safety of Skyrich Lithium engine start battery? A:It is safe to use our Skyrich Lithium engine start battery. Since it adopt the safe lithium iron phosphate positive material, soft package and heated sealing process. We ensure the battery would not explode or catch fire when using. Skyrich lithium battery have passed the test of UL lab, and got the certificate; we also passed the CQC quality safety testing of China quality certification center. Q： How long is the shelf life of Skyrich Lithium batteries? A:Compare to lead acid battery (6 months), the Skyrich Lithium battery can be stored for more than a year. Q:How do I know if my motorcycle can use Skyrich engine start Lithium battery? Step5: if the motorcycle passes the above test, the Skyrich engine starts lithium battery can be installed on the motorcycle. Q: Why we say the Skyrich Lithium battery can save fuel? A:The voltage of lead acid battery is 12V, the voltage will reduce as the capacity falls as the batteries is operating. This leads to action efficiency weakness of spark plugs. But the voltage of Skyrich Lithium battery is 13V, and stable. The 1V voltage difference ensures the spark plugs be always in great form. It can improve the efficiency of spark plugs, producing bigger sparks, then the gasoline will be burnt more completely, unit kinetic energy increases the engine torque, which can improve vehicle running kinetic energy, ultimately improving fuel-efficient. Q: Why we say Skyrich Lithium batteries are much environmental friendly? A:The Skyrich Lithium battery adopts environmental friendly lithium battery materiel, such as lithium iron phosphate, Carbon, plastic etc, which all meet the Europe ROHS test, The Skyrich lithium contain no Pb, Cd, Hg, Cr6+ ,PBDEs or other harmful substance. Skyrich Lithium battery is a green and environmental friendly product. Q: Can Skyrich Lithium battery be used for cars? A:At this moment, most of our Skyrich Lithium batteries are used for motorcycles. We also have higher capacity designed battery (such as 51913), It apply to racing cars application in oversea market by installing a dedicated converter. But existing lithium battery cannot be directly used for cars, Specially cars designed with the battery and automotive engine in same cabin (the heat will affect the battery’s life cycle while the engine is running. Most Japanese cars have this design of the battery and automotive engine being in same cabin). The latest European cars and American cars have the design of engine in front and battery behind). We will develop the battery for larger engines in the near future, such as automotive engine. Q: If the dimension of Skyrich lithium battery is smaller compared to corresponding lead acid battery. How should I install the battery into the motorcycle firmly. A:we will equip high density and stick foam sheet or plastic spacer in the box, you can Install the spacer at the bottom of battery to adjust the battery’s height, or stick on the sides or bottom to fit original battery size, this job can be finished in a few minutes. This ensure Skyrich lithium battery maintain same size as original battery. Check the details in Skyrich lithium installation guide.